The announcement urged us to get back to our vehicles and we scrambled to our seats and fastened the seat belts. I glanced at mum and said ‘This is it, mum! Are you ready?’ Mum adjusted her sunglasses rather nervously. I wasn’t too worried about disembarking from Le Shuttle and joining A26 as I had done it before when I drove to Paris with Mr.B. From Calais, A26 was the only motorway and the direction was clearly signed, therefore, it would be very difficult to go a wrong way. *Please note that all the photos taken from the car during our journey were shot by my mum with her iPod Touch. 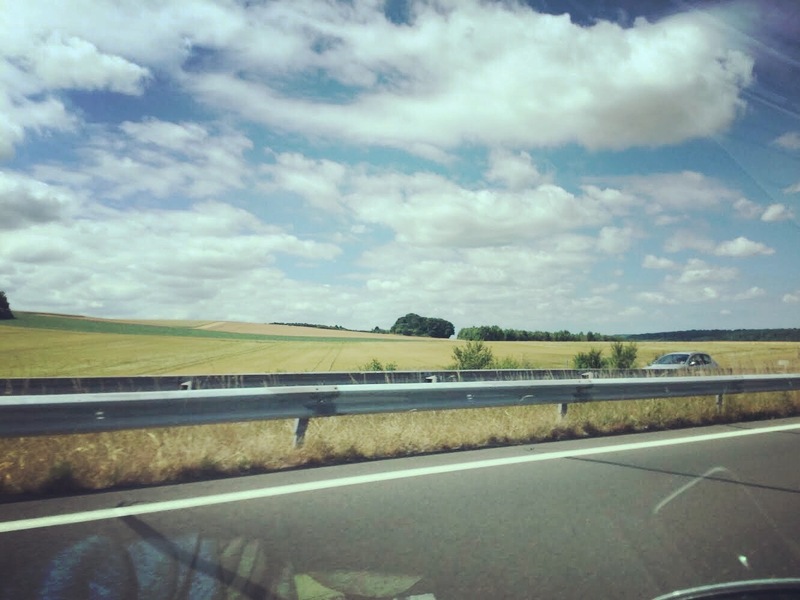 Our destination of the day 1 was Reims which was 274km (170miles) away from Calais. One thing I was totally forgetting about was Autoroute 26 was a toll road. In Britain, most of the motorways were free except some bridges and tunnels, therefore, I became nervous when I saw gates with paying stations which were blocking my way. As we approached, I could see a driver in front of me pressed a button on the machine, like he was exiting a car park. As he pulled out a ticket, a barrier lifted and off he went. ‘Ok mum, push the button and pull out a ticket like he did!’ Poor mum, who was petite, had to undo her seatbelt and hoist herself out of the window, and reached towards the machine. Viola! It worked and we were on our way again. I can’t remember exactly how often we had to go through the ticketing barriers but there are more than a few of them along the route. The toll could be paid with either cash or credit card, and the methods of the payment each machine accepted were clearly visible from the distance. I was glad to have my mum sitting next to me because it would be very awkward if I were travelling alone as my car was right-hand drive and all the paying stations were designed for left-hand drive!